For two hours, I moved a line across and around a screen, without any real idea of what on earth I was doing. And somehow, I loved it. Interesting images, eclectic accompanying audio punctuated the whimsy. This strange game, one that turns the very expectations one has of a videogame on its head, thrusts you in to a world with no explicit instruction or direction. That ended up being its very undoing. In it, you play a long snake-like bit of string called the Long Mover. You’re able to move very nearly wherever you like , with a rather basic set of controls; you move with the stick, speed up with X and slow down with O. Tapping at the shoulder buttons causes the Long Mover to wiggle, which adds a speed boost – but it’s hardly something that mattered. Its opening level – if level is even an appropriate word – has you navigating free space, meandering around a black expanse with the odd boundary or circle to go around. They pulse when touched, colours flaring as you encircle them. After not too long, I had collected a dozen or so other Long Movers, all mimicking my actions, creating colourful spiralled shapes as we moved in unison, like a digital, videogame spirograph. They were instantly my friends as we flew through the air together. And then, I found a portal and they were gone. 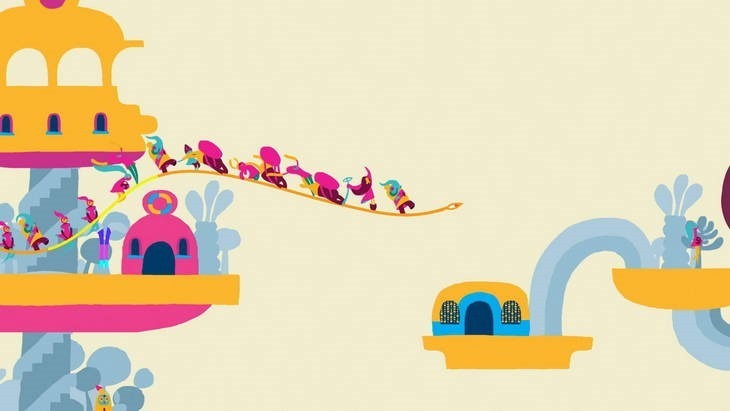 The goal of Hohokum is to find and free these long-tailed friends, though this goal is never implicitly stated. There’s one, hiding somewhere in each of the game’s stages. You’re never told where they are, or how to find them – or what to do in each of the game’s varied levels. 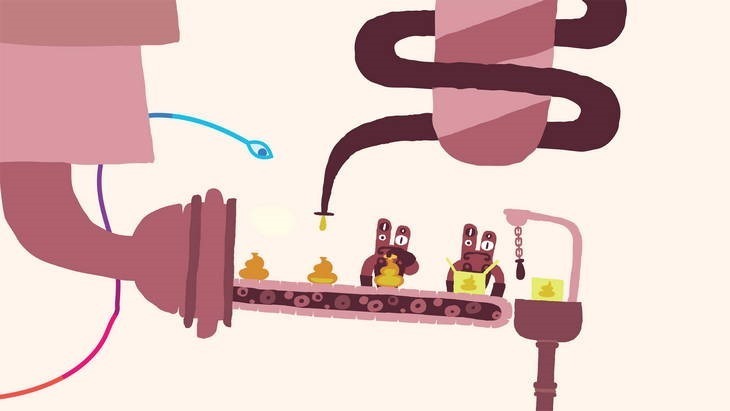 And that’s okay, because Hohokum is a game about exploration, and experimentation. And for the first handful of hours that exploring and experimenting is captivating and mesmerising, a pleasant task indeed. It looks fantastic; clean character designs reminiscent of things like Loco Roco, or The Beatles’ surreal adventures on the Yellow Submarine. It melds beautifully with the understated, dynamic musical score. Each of the game’s loosely connected, free-form levels – which you access from a sort of central hub – is filled with whimsy, and peppered with delightful flourishes that react to you in different ways. There’s always something; some little touch that adds a joyous bit of discovery to each area; each is begging to be explored. Interaction is limited to bumping, nudging or encircling things – and you’ll have to find out just what to interact with to complete a level. Each area, additionally, hosts a set of closed eyes that the Long Mover must encircle to open. 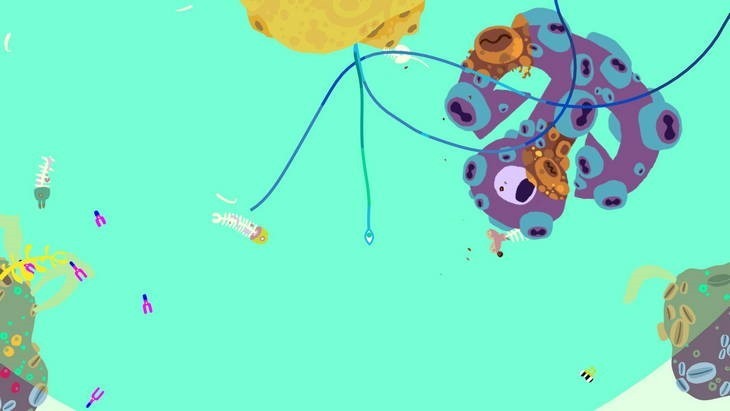 This probably represents the most “videogamey” bit of the entire, abstract Hohokum experience, though it works well enough at forcing the player to explore. It’s a beautiful, zen-like experience on the whole, reminding me of games like Flower and Fl0w, Botanicula and Proteus. That beauty is skin deep though. 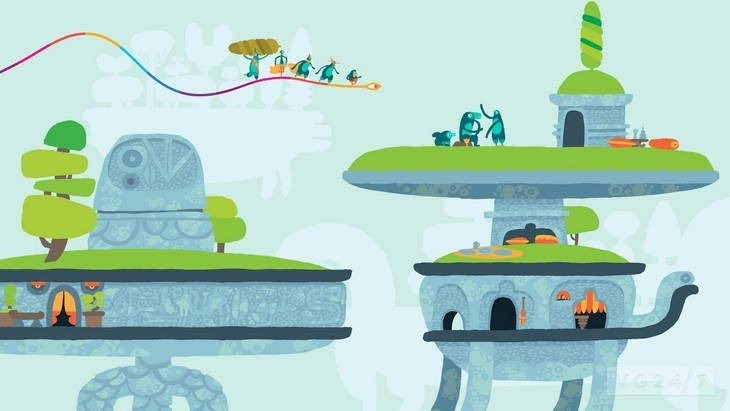 Hohokum shines as a bit of interactive art, but falters as a game. Once you figure out how it all works, whatever puzzle elements there are reveal themselves to be overly simplistic, even disappointingly basic. But even so, it often becomes an exercise in frustration, thanks to the lack of sing-posting or clear information about your goals. Navigating the games labyrinthine map requires progressing through a sea of holes, which becomes especially troubling when you have to get back to some or other level and you have to go through the same levels over and over again to find your footing. It’s especially tedious when you happen to leave a level incomplete, as any changes you make or progress you make in that level becomes null and void – so if you’re half way to freeing one of your serpent friends, that progress is wiped out if you leave the area while exploring. The abstract worlds and levels begin to quickly lose their charm. It’s a visual and aural spectacle, but one that’s certainly style over substance; art for art’s sake, without underlying game “meat” to back it up. After a handful of hours, I found myself meandering about aimlessly, having lost all interest in finding every last serpent. I’m glad it exists, and I had some fun with it; especially in those joyous first few hours – but in the end, what you’re eventually buying is little more than a gloriously interactive screensaver. 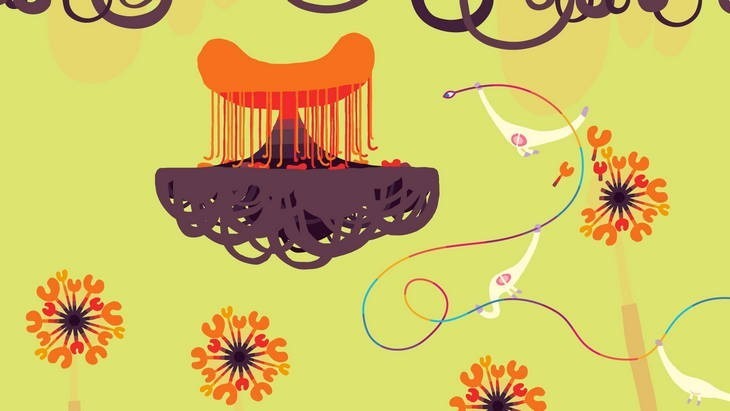 It’s difficult to adequately explain or describe Hohokum. It’ll fill you with a child-like sense of wonderment with its abstract exploration, but as a game, its definitely a case of style over substance.